Sometimes the simplest aspects of English conversation can be the most frustrating. Do you want to invite a new friend for a coffee, but are worried about mixing the days up? Do you need to make an appointment on the phone, but are worried the other person won’t understand you? 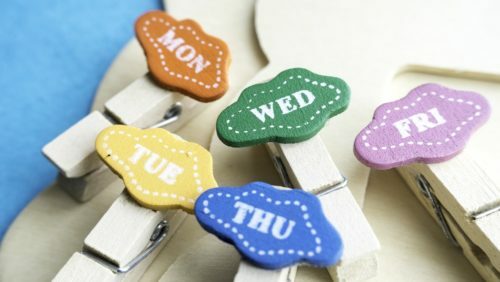 Talking about the days of the week in English seems simple, but getting it wrong can cause some serious scheduling confusion. It doesn’t help that all the English days of the week look quite similar! In this post, we’ll give you tips to memorize, pronounce and correctly use each day of the week in English. We’ll also show you some common English idioms and abbreviations related to the days of the week. Using the English days of the week might take some getting used to, especially since you’ll be so used to saying these words in your own language. The best way to learn is always through practice, so you can start by organizing your own calendar or diary using the English words. Some people prefer to plan on paper, but there are plenty of websites in English that’ll help you create a timetable yourself. If you’re a student, consider using platforms like Any.do or MyStudyLife, which let you organize your calendar and make to-do lists. This is a great way to integrate new vocabulary into your daily life while making English practice a part of your regular routine. It’ll also prepare you for life in an English-speaking country, where knowing the days of the week (and their abbreviations) is an important skill for managing your time. FluentU will boost this immersive English learning even more. With FluentU, you’ll hear the days of the week (and lots of other English vocabulary) used in real-world English videos, like movie trailers, music videos, inspiring talks and more. Best of all, each video has been transformed into a personalized English lesson for you. The videos come with interactive captions. Click any word for an instant definition, pronunciation and picture. There are also transcripts, flashcards and exercises so you’ll fully understand and remember all the new words. Since the videos are organized by genre and learning level, it’s super easy to find ones that work for you. For example, this simple, colorful sing-along will help you memorize the English days of the week, while this commercial will let you hear some days of the week used in context. You can check out the full video library for free with a FluentU trial. In many languages, the days of the week come from the names of the planets or the ancient gods that represented them. This is the case in English, which follows the Germanic names for these gods. The etymologies (word origins) for all words below are based on this Live Science article and confirmed with the Merriam-Webster dictionary. Monday is the day of the moon god. In Old English, mōna was the name for the moon, and from this we get the name Monday. In English, you might hear people talking about a “Monday morning feeling.” This is a popular idiom which means being downhearted about starting a new workweek. You may also hear someone tell you that they have the “Monday morning blues.” Again, this means that they feel tired or annoyed about having to get up early and go back to work. You might want to offer them a cup of coffee! On a calendar, you may see Monday abbreviated to “Mon.” This is useful when you’re making a quick note, but sounds strange when you say it aloud. In conversation, be sure to stick to the full name for each day of the week. In Ancient Rome, this day of the week was named after Mars, the god of war. This is how we get mardi in French or martes in Spanish. But in English, the name comes from the Norse god Tyr (also spelled Tiw or Tiu). Tuesday can be abbreviated to Tu., Tue. and Tues. Again, these abbreviations are only used in writing. This word is out to trick everybody. Even native English speakers find it strange. It’s probably the hardest English day of the week to remember, because most languages name this day after the Roman god Mercury. You might expect it to begin with an “m” like mercoledì in Italian or mercredi in French. However, in English, this day is named after Woden, the Norse god of wisdom. You can use this to help you remember, because “wise” and “Wednesday” begin with the same letter. In diaries and calendars, you’ll see Wednesday abbreviated to Wed.
A popular hashtag that English-speakers use on Instagram is #throwbackthursday. In English, a “throwback” reminds you of something that happened in your past, so this hashtag is used to share memories such as holiday photos or baby pictures. There are a few ways of shortening the word Thursday. You can use just the first two or three letters, but it’s most commonly written as Thurs. It’s a chance to unwind after a week of work, to go out with friends or to spend time with family. It seems appropriate that in English it’s named after the Norse goddess Frigg, who represented love, marriage and wisdom. “That Friday feeling” is a popular English expression. Unlike “Monday morning blues,” it means feeling excited about the end of the workweek. “Get that Friday feeling” is a phrase you may encounter in advertisements, meaning that a product is supposed to make you feel the same sense of happiness and anticipation as you would before the weekend. You’ll usually see the word Friday abbreviated as Fri. in writing. There are seven days of the week, but there are only five “weekdays.” This word refers to the five days we’ve already covered, when most people are at work or studying. Saturday is named after the Roman god Saturn, but Sunday is easy to remember. It simply means the day of the sun. The written abbreviations are also pleasingly easy: Sat. and Sun. In English, there are plenty of idioms that use these words. If somebody asks you to come dressed in your “Sunday best,” they want you to wear your nicest clothes, because traditionally that’s what you’d wear if you went to church on Sunday. If someone talks about a “long weekend,” they mean not going to work on Friday or Monday, and having a short holiday. Perhaps one of the weirdest English expressions you’ll hear is, “it will never happen in a month of Sundays.” This means that something is never, ever going to happen, so you probably shouldn’t hope for it. When you’re focusing hard on a new language, it’s easy to forget how important it is to go over the basics. Sometimes we’re so intent on forming complex phrases and learning difficult vocabulary that we completely brush over things as simple as the days of the week. Once you feel secure using these words and phrases in conversation, your confidence will begin to grow and grow.